A sleeveless jersey dress with a scoop neck and a high back. A special burnt-out technique creates a delicate pattern. Team with leggings. Length approx. 84 cm. 50% polyester, 50% cotton. 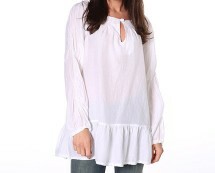 This extremely cheap ruched tunic top is a great value for money. Get it now and choose from five different colours - white, khaki, orchid, grey and blue. In on trend water print complete with self fabric tie belt that cinches in the waist. Looks gorgeous teamed with white jeans and heels for an evening summer outfit.